There comes an unfortunate time in every garage doors life when it needs to be replaced. Garage doors are something that we use everyday for our safety, convenience, and the protection of our vehicles and storage, but it isn’t something that we think about that often. We often pull the car out of our garage in the mornings and don’t think about them again until we get home after a long day. – and other visible signs that something is wrong with your garage door. There are several significant indications that your garage door may be unsafe and need to be repaired or replaced. We are going to take a look at some of those signs and what you can do about them. You may not know this, but one of the most important and most dangerous working parts of your garage door is the springs. The springs are incredibly powerful and taught, and when they wear out, they can snap and cause serious injury. The first thing to do is make sure that your springs are covered. Exposed garage door springs can be dangerous. Next, if you suspect that one of your springs is broken, call an expert to come out and examine them. They will replace them if necessary. If you need to replace one spring, make sure that you just go ahead and replace both so that the tension is even in each spring of your garage door. The next thing that you want to make sure of is that your garage door cables are in good shape. The cables of your garage door are what anchor your springs to the bottom brackets of your garage door, and if they become worn out or frayed, they can cause serious injury when they break. The good news is that you can visibly inspect the cables on your own to see if they are looking a little worn. If they are, do not tamper with them. Call a garage door expert as soon as possible so that they can safely replace your worn out cables. Is Your Garage Door Squeaking? It is entirely characteristic that over time, your garage door will develop some creaks and squeaks. Those sounds are perfectly normal for garages to develop over time, much like older houses will begin to develop noticeable creaks in the floor. What you don’t want, is springs that end up getting too dry, which can end up wearing your springs out faster and can cause them to break or snap. Keeping your springs well lubricated is an excellent way to keep your garage door safer and quieter. Just add a spray on lubricant to your springs to keep them lubricated and smooth. If your springs are still vocal after you lubricate them, make sure that you call a garage door expert to come out to inspect your springs, in case they may need to be replaced. 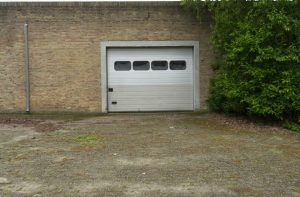 If you have just moved into a new home, there is a good chance that you have an existing garage door. It’s never a bad idea once you have moved to make sure that you take a close inspection of your new garage door to see that all of your parts are in good shape. Your garage door may have extension springs installed with it. Extension springs are what attach to the ends of your main spring (or springs) and anchor it to the wall or ceiling. When our garage door is closed, it puts a lot of tension on your safety springs, which can cause your spring or extension springs to break or snap. Safety cables are installed to make sure that your broken extension springs stay contained so that they don’t cause harm. When examining your garage door, if you notice that you do have extension springs on your door, but don’t have safety cables to guard them, call a garage door expert immediately. They should be able to install them so that you aren’t running the risk of an accident. If you have never had your garage door inspected, it’s not a bad idea for your safety to take a quick survey of the garage door. Check to see if it looks like anything is missing or out of place. When in doubt or if you notice a problem, contact a garage door expert immediately. Garage doors are dangerous to handle without having a seasoned expert to take a look at them.